Spaghetti squash is a nutritious vegetable that’s low in calories and easy to cook in the oven, slow cooker, Instant Pot, or microwave! Let me show you how to cook a spaghetti squash four ways and make sure to check out all my favorite spaghetti squash recipes, too! Despite its name, if anyone tells you that spaghetti squash is exactly like spaghetti they are straight up lying to you. Or they are delusional and trying to convince themselves that a vegetable can actually mimic pasta in taste and texture. It can’t. Spaghetti squash doesn’t NEED to mimic pasta; it can stand on its own merits. It does have long, spaghetti-shaped strands that do work well as a stand-in for pasta if you’re trying to eat low carb or just simply want up your vegetable intake. I love that about the amazing spaghetti squash! If you haven’t tried it, I know you’re going to love this vegetable so much and want to show you how to make spaghetti squash five different ways. These are all great ways to cook spaghetti squash and which one you use will depend on the day, what you have available, and your schedule. The worst part about the spaghetti squash is cutting it! It has a hard outer shell that is very difficult to cut through when it’s raw. You’ll see that two of the methods of how to cook spaghetti squash DON’T require you to cut it before cooking. Hallelujah! 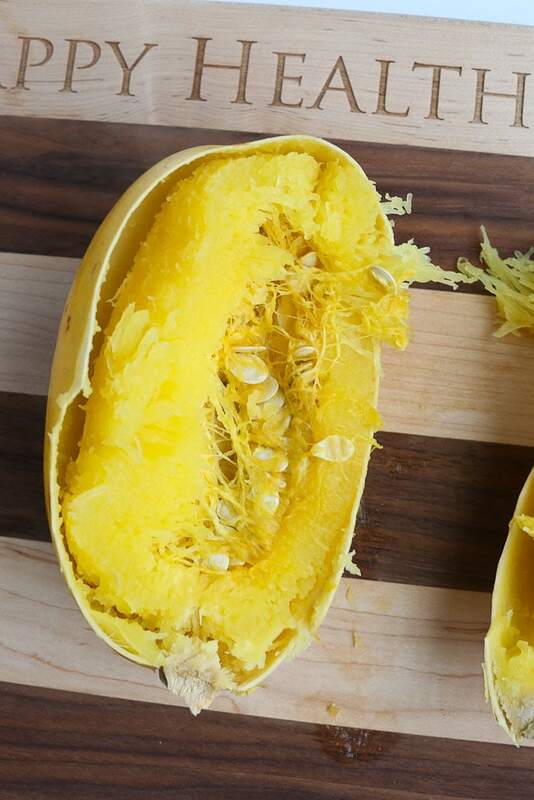 But when you do need to cut it, here’s the easiest way to cut a spaghetti squash. Start with two sharp knives, a small knife and a larger chef knife. You are going to be cutting your spaghetti squash in half length wise. Using the small knife first, pierce the spaghetti squash in the middle. Hold the stem-side of the squash with your hand, and moving the knife in the opposite direction, make a shallow score in the squash in a straight line until you get to the end of the squash. Rotate the squash so your hand is now gripping the opposite side of the squash. Place your knife in the middle again, and continue the straight line score in the opposite direction until you have a full line the length of the spaghetti squash. This score will help your large knife stay in the line you want to cut when you are halving the squash. Now place your large knife in the middle of the score and hold the squash with your other hand on the stem side. Press the knife firmly into the squash until it is almost through to the bottom. When you’re almost to the bottom, life the squash and smash it down onto the cutting board. The extra force will help your knife go through the bottom of the squash. Rotate the squash and repeat this with the other side and it will be cut in half. Now you can scrape out the seeds with a spoon. I will list the methods and directions according to time, starting with the method that takes the longest and move to the fastest method. 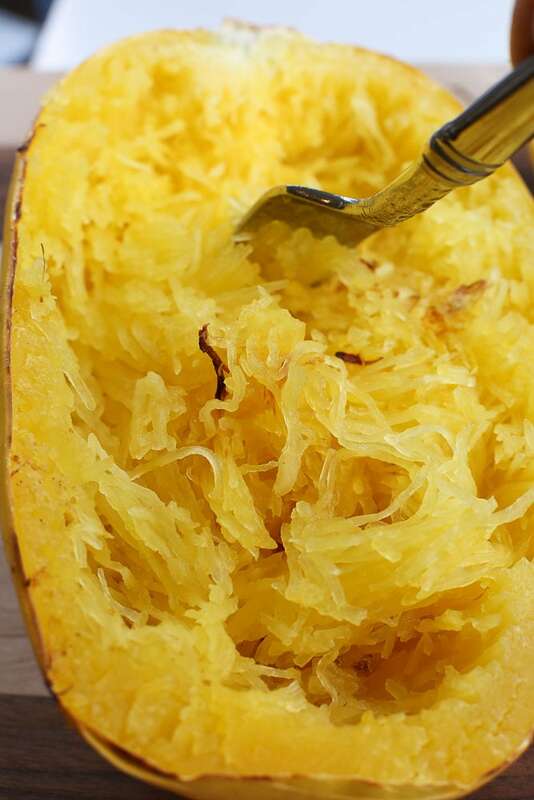 There isn’t a best way to cook a spaghetti squash, just a best way for YOU! Read these and find what’s going to be best for your situation. At the end I’ll include a printable form so you can print and save these instructions in one place. The slow cooker is a great method for cooking a spaghetti squash because you don’t have to cut it first! It’s also wonderful if you don’t have enough time around dinner to cook the squash; you can put it in earlier in the day and have it ready at dinnertime! Wash one large spaghetti squash with soap and water. Pierce the top of the squash 4-5 times with a sharp knife. Place the spaghetti squash in the slow cooker and cook on low for 5 hours or high for 3 hours. Carefully remove the spaghetti squash from the slow cooker. It will be flimsy. 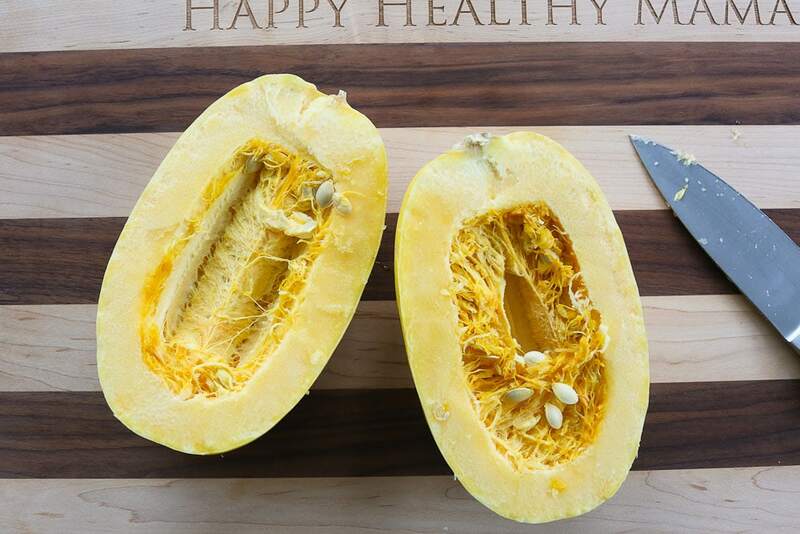 Cut the spaghetti squash in half and use a spoon to remove the seeds. Then use a fork to remove the strands. This is the method of cooking spaghetti squash I’ve used the most. If you prefer using your oven, you’ll love this method! 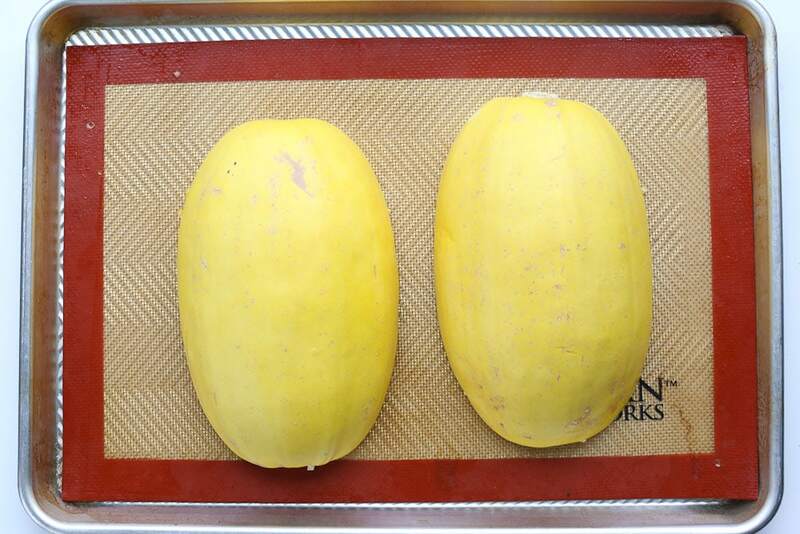 Using the instructions above, cut your spaghetti squash in half length wise and remove the seeds. Roast in the preheated oven until the squash is fork-tender, about 45 minutes. Once the squash has cooled, use a fork to scrape out the strands. I recently tried cooking my spaghetti squash in the Instant Pot and have was SO happy with the results. You get the best of both worlds with this method. You don’t have to cut the spaghetti squash first AND it’s quicker than the slow cooker. WIN!! Wash a small spaghetti squash with soap and water. Larger spaghetti squash won’t fit in the Instant Pot and will need to be cut. Since we’re trying to avoid that, stick with a small squash for this method! Place 2 cups of water in the Instant Pot and place the trivet your Instant Pot pressure cooker came with in the bottom of the pot. Place the whole spaghetti squash on the trivet. Press the manual button on your Instant Pot and cook at high pressure for 25 minutes. Use the quick release method to release the pressure. Allow the squash to cool, and then carefully remove from the pot. It will be flimsy. Cut the squash in half length wise and scoop out the seeds with a spoon. Use a fork to scrape out the strands. I prefer to not cook in my microwave, but sometimes emergencies happen. If you need your spaghetti squash super quickly, you might just have to turn to your microwave. The good news is, you can microwave it whole for a few minutes and it softens up enough to cut it in half much more easily than when it’s raw. Pierce the spaghetti squash with a knife in a 5-8 places. Place the whole spaghetti squash in the microwave and microwave on high for 4-5 minutes. Carefully remove the spaghetti squash from the microwave and cut it in half length wise. Scoop out the seeds with a spoon. Microwave on high in 5 minute intervals until the squash is tender and cooked. The length on time depends on the size of the squash. A small squash be finished after the first 5 minutes, a larger squash will likely need at least 10 minutes. Carefully remove the plastic wrap and allow your squash to cool. Scrape the strands from the shell with a fork. Congratulations! 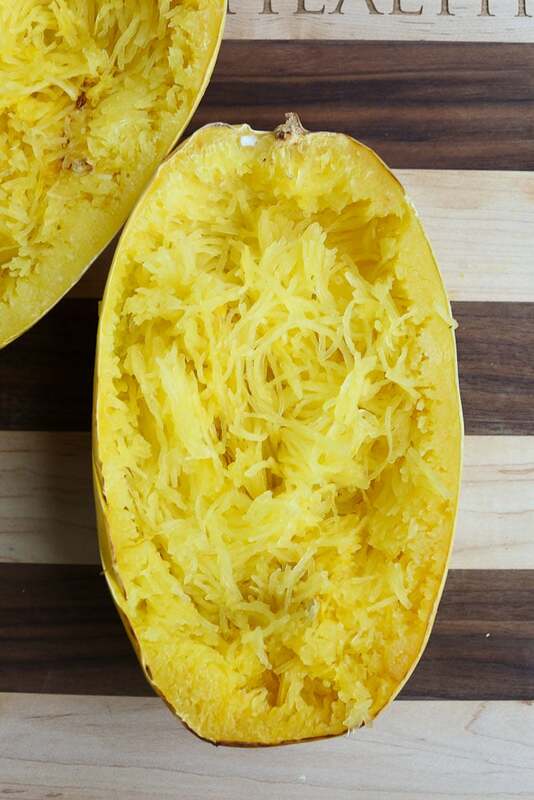 You have a delicious, ready-to-eat spaghetti squash. The possibilities are endless. It actually tastes amazing plain, right out of the oven. You can make it a meal by adding marinara sauce, a little parmesan cheese, and eat it traditional spaghetti-style. Check out all of these spaghetti squash recipes for more ideas! There are many ways you can cook a spaghetti squash. 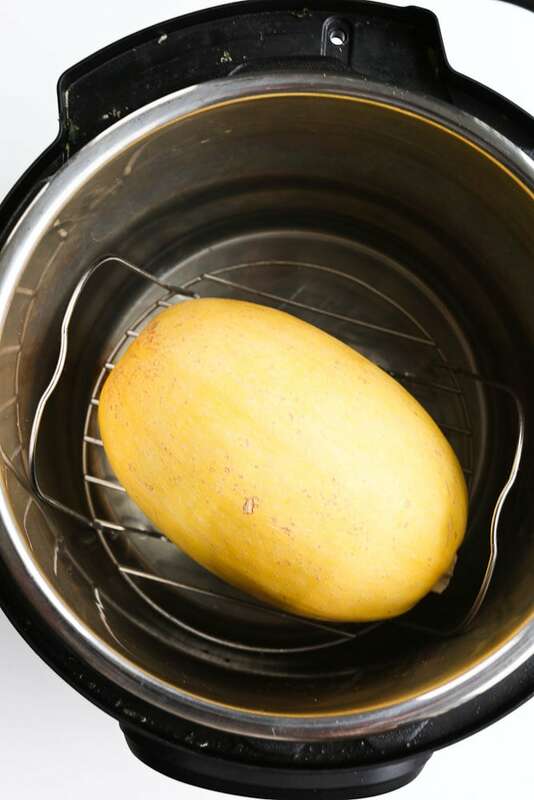 Here are the instructions for how to cook a spaghetti squash in the slow cooker, oven, Instant Pot, and microwave! This post was originally published in 2011. I updated it in 2019 to include more methods for how to cook spaghetti squash! I haven’t been a huge fan because I always seem to have a hard time cooking these all the way, so some of the strands are always a little crunchy. Is that normal or should the texture be more similar to pasta if it is cooked properly? I’ll have to try your method and see if I have better success, because it would be so awesome if my pasta-crazy 4 year old would like this as much as pasta! My strands are never crunchy at all. I’ve never cooked it any other way, so I’m not sure if it’s the method I use or not. I would guess you just need to cook it longer. Do you open it up first? I know some people bake it before cutting, so maybe that is why? Yum! I LOVE spaghetti squash, but I can never get my husband to eat it. I think if I smothered it in sauce and melted cheese, he might reconsider it 🙂 But I agree – it’s a great vegetable and such a blank canvas – you can try lots of variations with it. I love food like that! Thanks for the tutorial – I’ll have to try this! Thanks so much for this—–this has been one vegetable that I have feared cooking because I didn’t know how to do it. I know, how silly. We will definitely try your method. It looks delicious! It’s funny because we eat butternut squash, acorn squash, pumpkin all of the time and I have never feared cooking any of those. Maybe it’s because you don’t see very many recipes using the spaghetti squash?? I’ve never seen a spagetti squash at my store so I was wondering if you can make it using a butternut squash instead? The dish sounds delicious! Yum! I love spagetti squash, but always forget about it. Thanks for the reminder!! Instead of discarding the nutritious seeds when you scoop them out, throw them in a green smoothie…can’t even taste them! You can do this with cantaloupe seeds & pumpkin seeds, which also are loaded with nutrients. Whoa! I never thought of tossing the seeds in my smoothie. We’re having spaghetti squash this weekend. I’ll hang on to the seeds this time. Thanks for the tip! Maryea! Finally, thanks to you, I had Spaghetti Squash Success! (Just posted about my ‘experience’ a few minutes ago.) Thanks for the inspiration! I love spaghetti squash. I like using the shell as the bowl for the meal, if it’s a small enough one. I’ve never used my Instant Pot for cooking one, I’ll for sure have to try that. Thanks for the ideas! I love make ahead recipes, especially ones I can make for a crowd.